On December 14, 1992, Wayne Lo, an 18-year-old student at Bard College at Simon’s Rock in Massachusetts, stalked the campus with an SKS semiautomatic rifle, killing two people and wounding four others. Today, Wayne is serving two life sentences without the possibility of parole. Greg Gibson’s son Galen, then also a student at Simon’s Rock, was murdered that night. In the years since, Gibson has set out to understand how these events came to happen. He interviewed other people involved in the shooting, and later put those conversations into a book, Gone Boy: A Father’s Search for the Truth in His Son’s Murder. After it was published, Gibson started getting letters from Wayne Lo. In this episode, we learn more about Greg Gibson, and the 25-year journey that led him to to have a conversation with the school shooter who killed his son. Bottom photo: Wayne Lo and Greg Gibson. Released on December 12, 2017. Michael Garofalo (MG): The conversation in this episode was difficult to have, and it may be hard for some people to hear. Greg Gibson (GG): My name is Greg Gibson, and I’m speaking with the man who killed my son. (MG): The events that led to this interview started 25 years ago, with a school shooting, on a college campus in western Massachusetts. By now, we’ve grown accustomed to these events and their details. A troubled young man gets a semi-automatic gun, goes on a rampage, kills and wounds innocent people. These things sound commonplace, almost routine, to our ears in 2017. But in 1992, when this shooting happened, they weren’t. This was before Virginia Tech, before Newtown, before Columbine. The other thing that isn’t common or routine, then or now, is how Greg Gibson, as the father of a murdered student, chose to respond. (GG): Almost since that first moment, it has been my constant prayer to take this most awful of things that could possibly happen, and turn it into something good. So that it’s not all just a pure waste and loss. (MG): This would ultimately lead Greg to a prison in Massachusetts, where he sat face to face with his son’s killer. This is the StoryCorps podcast from NPR, I’m Michael Garofalo, we’ve got that conversation, and the story of how it happened, after this short break. Stay with us. (MG): Welcome back. In this episode, a father speaks with the school shooter who murdered his son, 25 years ago. On December 14, 1992, Wayne Lo, a student at Simon’s Rock College, in Massachusetts, stalked that campus with a semi-automatic rifle, loaded with ammunition he had ordered over the phone and had shipped to him at school. At the time, he said he was receiving commands from God. Firing at random, he killed two people and wounded four others. Today, he’s serving two life sentences without the possibility of parole. Greg Gibson’s son, Galen, was murdered that night. In the years since, Greg has set out to understand how it happened, in hopes of keeping others from living through what he has. He interviewed other victims and their families, school officials, even the man who sold Wayne Lo the gun, and he put those conversations in a book. Then, after it was published, he started getting letters from the one person he hadn’t talked to, Wayne Lo. And as the 25th anniversary approached, Greg visited Wayne in prison, for a StoryCorps interview. He wasn’t looking to forgive or to find closure, just to look Wayne in the eye, and talk. It was the first time they had ever spoken. GG: Yeah, I think it bothers my son. He just doesn’t wanna have anything to do with it. He doesn’t wanna talk about it. And I respect that completely. So yeah, I think they think I’m a little crazy. But they’re proud that I’m working for Galen so that people don’t have to keep doing this. I don’t think any of them would like to be here, with me, talking to you, no. And, that’s just the way, you know, that’s the way it is. 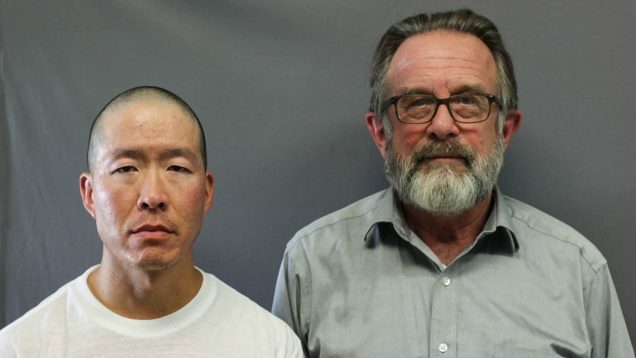 MG: Greg Gibson with Wayne Lo, who murdered his son Galen, in a shooting rampage at Simon’s Rock College, 25 years ago this month. If you’re feeling a little unsettled right now, rest assured you aren’t alone. This is the kind of conversation that maybe raises more questions than it answers. At least it did for us, here at StoryCorps. And I’m gonna be joined for the rest of this episode by another StoryCorps Producer, who is familiar to you listeners, Jasmyn Belcher Morris. Hey, Jasmyn. Jasmyn Belcher Morris (JBM): Hey Michael, yeah so we’re gonna kind of switch seats from how we usually do this, when I’m on the show. Normally you’d interview me or one of our other producers to get more background on the story we just heard. But you were actually the producer on this piece, so I’ll be asking you the questions. JBM: So one of the first, and most obvious questions is, how could Greg bring himself to do this? Who is this guy, and how did he end up in a place where he could even have this conversation? MG: So as you can probably guess, the answer to that question is kind of long. Uh, Greg is a rare book seller, he lives in Gloucester, Massachusetts with his wife and two other kids. I spent a lot of time with him in the year leading up to the interview, and you know, the word “journey,” I think, is really overused, and I usually try to avoid it, but in this case, it’s the right word. And to understand how Greg could come to sit down with his son’s murderer, it’s really helpful to trace his path over the last 25 years. So back in the winter of 1992-93, as details of the shooting began to come out, Greg just felt certain that something could have been done to stop it. Remember, Wayne ordered the ammunition over the phone, and it was shipped to him on campus. The package, clearly marked as ammunition, was brought to a school administrator before it got to Wayne. And the administrator ultimately decided he couldn’t open someone else’s mail, and the package went through. There was also an anonymous phone call, in the hours before the rampage, warning the school that Wayne had a gun and was going use it. And what bothered Greg the most about all this was that the college wouldn’t take any responsibility. So he decided to launch his own investigation, he’d find out every detail of what happened, and put it in a book for the world to see. Here’s Greg. GG: I’m gonna write this book, and I’m gonna blow the lid off Simon’s Rock College, and I’m gonna – these people are gonna pay. I was furious, I was – I was madder at them than I was at the killer, because it seemed to me, at the time, the killer was just crazy, and there was nothing to be done about that. But these guys were rats. MG: So he sets about interviewing everyone involved in the shooting who will talk to him. But then something happens. GG: The more people I talked to, the more sides of the story I see, the more I realize that the story is so much bigger than my small need for revenge. And my – and my small rage, and anger. Because I talked to these people, and even the – even the, like the guy who sold the gun…what I saw, more than anything, was their humanity. And continually being exposed to that humanity, the suffering of the killer’s parents, who in a way, suffered a worse insult than we did. I just realized, even if I fulfill my vengeful mission, there’s – there’s just no redemption in that. It’s not – it’s not gonna do me or my family any good. MG: At this point, Greg’s project becomes something else. It becomes a sort of search for truth or an attempt at understanding. Maybe even a reach for some sort of meaning. It’s not a path many of us would choose, and even if we did, could we stick with it? I mean, could we face the college administrator who let the package through? Could we introduce ourselves to the man who sold the gun? Could we go get that gun out of evidence and hold it in our hands? Which Greg did. He even joined the NRA, and a local gun club, to try to understand that point of view. JBM: So choosing to do the interview that we just heard isn’t exactly out of character for Greg? MG: Right, I mean it’s totally consistent with just about everything else Greg’s done since Galen was killed. JBM: Yeah, so I’d love to know more about Greg’s son, Galen. Can you tell us more about him? MG: Well, Galen was the oldest child, and by all accounts, a great big brother. I spoke with his younger sister, Celia, who was sort of the apple of his eye. He was 18 when he was killed, and Greg tells me he was a really unique kid, very smart, very stubborn, with an off-kilter sense of humor. He was, in fact, exactly the type of kid who ends up at Simon’s Rock. JBM: What do you mean? MG: Well, Simon’s Rock is what’s called an early school. It takes really smart kids who don’t quite fit into a regular High School, and starts them on college work early. So Simon’s Rock was really a great fit for Galen, and he–he really found himself and his people there. JBM: So what then Wayne Lo to Simon’s Rock? MG: Well, Wayne is actually from Taiwan. His father had a military career there before moving the family to the U.S., and Wayne spent his early teen years in Montana, where his parents ran a Chinese restaurant. He was a gifted violinist, even playing with the local symphony when he was still a teenager. But he was a teenager, and he wanted to get away from his parents, so he convinced them to let him go to this school, thousands of miles away. But something changed while he was there. Wayne became angry, withdrawn, contrary. It was a really liberal place, especially for the 1990’s. And Wayne took this very conservative stance, even going so far as to argue these outrageous and homophobic positions in class. All that anger, plus whatever caused him to have these delusions about a mission from God, plus the ease with which he got his gun, these things, they came together in a really awful, awful way. JBM: So at the top of the podcast you said that Wayne and Greg wrote to each other. Tell me more about their relationship. JBM: Yeah, so after Greg’s book comes out, Wayne finds out about it, reads it, and as he says in the piece, it changed his whole perspective. He wrote to Greg and took responsibility for what he’d done. He apologized, and he said he expected nothing in return. But Greg did write back, and then Wayne starts donating to the memorial fund that the Gibson’s set up in Galen’s name, by making artwork in prison. GG: He had a guy on the outside who would sell this stuff, and he’d get the money, and send it right to the Galen Gibson Fund. And if he wasn’t the biggest contributor in dollars, he was certainly the steadiest contributor, over the years. JBM: So where does the money go? Greg said it was a scholarship fund? MG: Yeah it started as a scholarship fund, but over time it sort of morphed into something else. And Greg and his wife decided that they should start giving money to organizations that help other victims of gun violence. JBM: So the money that a school shooter makes by selling his artwork, goes to a fund that directly helps other victims of shootings? JBM: Yeah, it really is. MG: You know, Greg describes it as being united in hopes of a greater good. Of somehow improving the situation in this country, that results in these kinds of shootings happening over and over again. That’s what’s kept Wayne and Greg in contact always these years. JBM: And is that what brought them together, for their StoryCorps interview? MG: It is. You know, this sort of utilitarian purpose. That telling their story together could draw attention to the long term damage that the shooting has caused. And maybe it would make people think differently, or more deeply, about why they keep happening. JBM: So there’s something that I want to ask you about. We hear in the tape that Wayne really has this outpouring of emotion. Uh, did that surprise Greg at all? MG: You know, it did. I talked to him afterwards and asked him, you know, what the whole experience was like for him, and this is what he told me. GG: Wayne enters the interview room and takes one look at me, and, uh, bursts into tears. You know, coming into an experience like this you imagine it, over and over and over, in your mind, so that you think you’ve imagined every possible scenario. As – as a football player must imagine how a game would set up, I had imagined and imagined how this interview would proceed, and none of those imaginings [laughs], included Wayne, uh, taking one look at me and bursting into tears. JBM: So I know I’m not just speaking for myself when I say that hearing the parts of the interview where Wayne breaks down are really challenging in a lot of ways. MG: Yeah, they sure are. Um, I was there for the interview, and I had the same reaction that a lot of other people have had. You know, you wonder when you hear Wayne cry, should I believe it? Is he sincere? And you know, even Greg has those questions, but when I asked him about it, this is what he had to say. GG: I imagine sitting around for the rest of your life in prison, uh, thinking about that one day that you did something so incredibly crazy and stupid – it must be a terrible meditation to have to uh-to have to live with. And it seems to me that as much as he’s able, he does truly want to have his life mean something, to be something more than just a killer who ruined lives. But I don’t know what his true mental state is. That’s a mystery and it will stay a mystery to me. I think it’s, uh, it’s probably a mystery that only God, I mean literally when we say God only knows, uh [laughs], in this case God only knows. JBM: You know, regardless, it’s really impossible to listen to this and not be impressed by Greg’s remarkable ability to just sit across the table and listen with such care and respond with such sensitivity. Where does the ability to do that come from? MG: Well, I asked Greg about that. You know, what resources he was drawing on, to be so empathetic. And at first he couldn’t explain it, he kind of stumbled. But ultimately he landed on the strength and support of his family, which he definitely does have. And you know, it’s also, for Greg, a sense of doing what feels right. And being kind, open, and trying to understand, is what feels right to him. JBM: So this December 14th marks 25 years since the shooting. What will Greg be doing on the anniversary? GG: Every year my wife and I, and my kids, and their spouses, and their children, we take a little Charlie Brown Christmas Tree, and we go down to the cemetery and we set it up on, um, Galen’s grave. And although it may seem like a, um, sort of melancholy [laughs], graveyard visit, it’s anything but that. It’s sort of something we can all do together, including Galen. And, um, predominantly it’s a – there’s a kind of joy to it. It’s rich, and nuanced, but it will be a joyous occasion. JBM: That’s all for this episode. This story was produced by Michael Garofalo. JBM: We have a voicemail line where you can call and leave a message for someone you hear on the show, and we’ll pass it on to them. The number is 301-744-TALK. That’s 301-744-T-A-L-K.
MG: For the StoryCorps podcast, I’m Michael Garofalo. JBM: And I’m Jasmyn Belcher Morris. Thanks for listening.